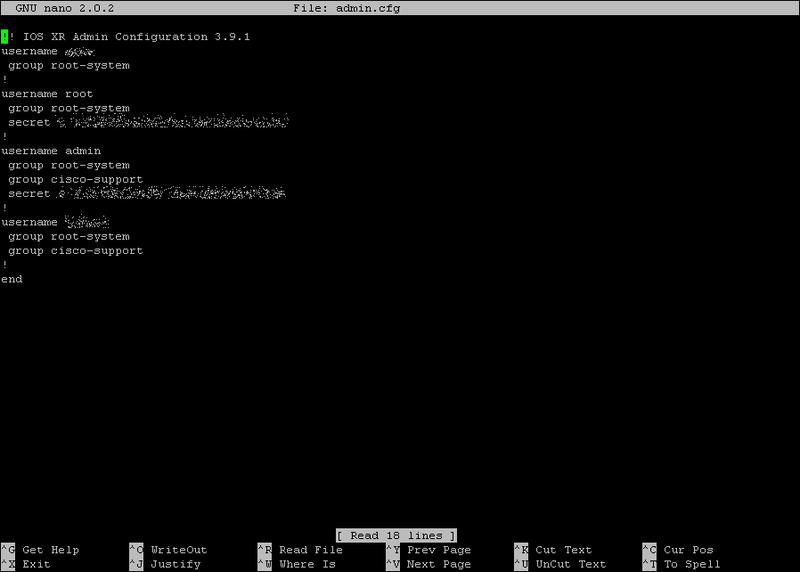 So, instead of entering the configuration line by line in CLI, you can create it using an editor and a temporary file. The same editors are also available for editing any text file that exists on your router's filesystem. In order to be able to use them, you just have to enter ksh mode by using the hidden "run" command. "run" is referenced briefly on CCO, but its usage is discouraged for everyday operation. # ls -al | grep ":$"
i.e. in order to edit the admin configuration using a much easier way, you just have to move to the correct path and edit the appropriate file (or your can supply the whole path in the same line). drwxrwxrwx  2 0         0              4096 Sep 15 22:09 .
drwxr-xr-x  6 0         0              4096 Aug 25 13:35 ..
...but i haven't tried to run complex scripts yet. The included perl modules are limited and i don't know if it's possible to add external ones. Note : Since ksh gives you a kind of low level access, you have to be very careful with it. During the last week i'm experimenting with an ASR9000 and IOS-XR and here is something tricky i found out yesterday. By following the above relationship in reverse order you end up with the required configuration. 1) In order to find the corresponding Task ID for a cli command, you can execute the "describe" command followed by the CLI command you're interested to. So, for the "sh int" command you need to have access to the "interface (READ)" Task ID. Keep in mind that Task IDs grant permission to perform certain tasks; Task IDs do not deny permission to perform tasks. 2) You create a new Task Group and put the above Task Id under it. 3) You create a new User Group and put the above Task Group under it. 4) You create a new user and put the above User Group under it. Now, when the above user logs in, he will have access only to specific commands that are associated with this Task ID (plus some others which are enabled by default). Also, he will be able to see the configuration of all interfaces. IOS-XR uses at least 2 running configurations on the ASR9000. The first one is called admin running configuration and you have to enter admin EXEC mode in order to view or change it. The other is called SDR running configuration and it is like the one that IOS uses (actually you have one running configuration per Secure Domain Router (SDR), but only one SDR is available on the ASR9000). Only users with root-system privileges can access the administration modes by logging in to the RSP for the owner SDR (called the designated shelf controller (DSC)). 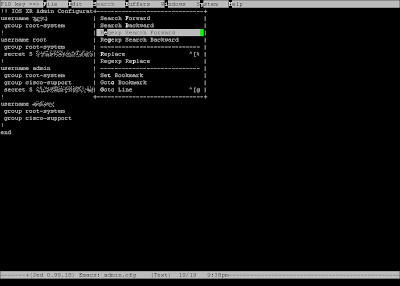 Administration modes are used to view and manage system-wide resources and logs. Users with root-system privileges have access to system-wide features and resources. The root-system user is created during the initial boot and configuration of the router. Now, let's suppose you are a root user and you want to allow a user to check the contents of a directory or a file. The "filesystem" Task ID is the one that will allow the user to execute the "dir" and "more" commands. The following user is allowed to do only that. With a little bit of searching on the available filesystems, you'll find out that this particular user can also view both the SDR and admin configurations in their full glory! These files are stored in clear text (ASCII) too, so everyone with access on the execute operation of the filesystem Task ID can also have access to their contents. In case you have some level 7 passwords into the running configuration (something you should avoid doing since you have the "secret" option), then you're probably risking a lot, because these can be easily decrypted. Luckily, admin configuration doesn't allow such passwords. What is more interesting is that the execute permission of the filesystem Task ID allows the user to also copy/overwrite a file (some configuration files are not allowed to be deleted, while some others are recreated "automatically" while doing a reload). There are some variables in ROM Monitor mode, that you can use in order to change the paths and names of configuration files, bypassing the normal startup procedure which by default loads the primary (binary) configuration. Again, all the above rommon variables are saved in clear text too, so the test user can still find them by simply executing the "more" command from the CLI. Now let's change IOX_CONFIG_FILE to point to a new configuration file. It doesn't really matter where the file is saved. Test user is still a member of the TESTGROUP User Group, which has limited access. Step 2 : Test user changes the contents of the above file in order to make himself member of the root-system User Group and uploads it in the same path as the original configuration, overwriting it. Step 4 : A little bit later a Root user makes a reload and voila! Test user gets root access! The above happens only when you have set the rommon variable to use a different configuration file. Exactly the same thing can happen for the admin configuration too. It's even easier there, because you can just upload a new file and overwrite the current one, without having to change the rommon variables. 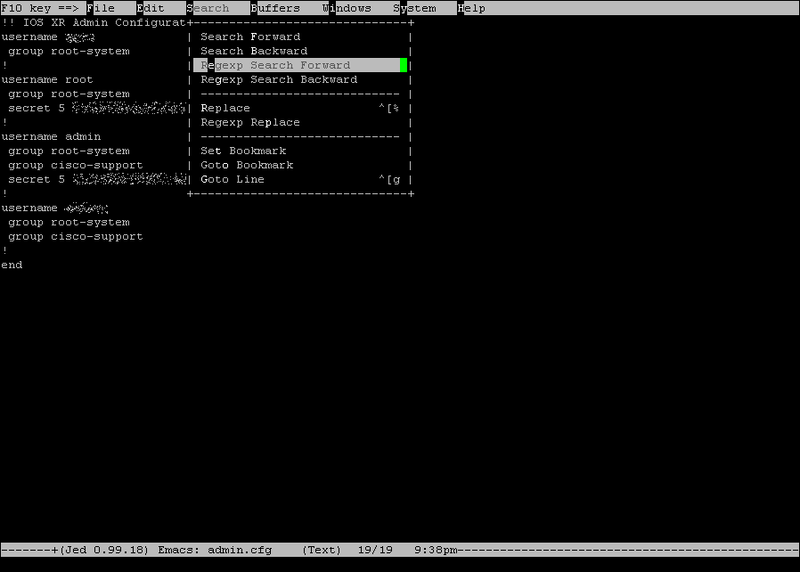 Then you'll get root access to the admin mode, which means you have admin access to the SDR too. What seems strange to me is that the primary configuration in IOS-XR is stored in binary (SysDB) format (you can find it in the same path as above) and the secondary one (which is in ASCII format) should be used only in case of emergency (corruption?). I guess a possible inconsistency between these 2 configurations after the reload, makes the ASCII configuration override the binary one. Keep in mind that while doing the reload, there are no warning messages about configuration inconsistencies. If the actual admin executes "clear configuration inconsistency" or "cfs check" while in admin mode, the ASCII configuration you just uploaded will be updated by the current running configuration, so the changes will be lost. But, if a reload is executed from admin mode without first giving the above commands, then the test user will get root access after the reload. If a reload is executed while on SDR, regardless of whether the above two commands are executed too, then there won't be any effect on the admin configurations and the test user will again get root access after the reload. After all, how often do you use the admin EXEC mode? Imho, filesystem permissions should get re-organized. Critical files or "dynamic" paths where critical files reside should be available under a new Task ID. Until the above is fixed, you should not allow every user to use the filesystem Task ID, unless there is absolute need to give the above permissions. If you want to have better control of your users' permissions you should think of using an external aaa server (i.e. tacacs) and apply attributes that restrict them in executing specific commands with specific arguments. 1) The availability of configuration modes always depends on the software packages that are installed on your system and on the router platform that you are using. 2) You can find a list of all Task IDs under IOS-XR 4.0 and their required permissions here. 3) I'm sure someone else will know a lot more about the IOS-XR internals (after all, everything written above was found by one week's experimentation). Please feel free to submit any corrections. 4) If you happen to have some extra permissions regarding utilities, then you can probably modify the configuration files online, by using xargs,perl,vim. This seems like a big difference, but it may not be relevant to your case, unless you know how to count them easily. An easy way to start experimenting is the "sh tech-support" command, which includes a lot of information. A variant of this is "sh hw-module slot x tech-support", if you're interested in a specific module. Beware of bug CSCta88917 if you try this. Bug toolkit doesn't say anything useful, but after we opened a new SR, we had to rma the whole module, because according to the tac engineer the crash was due to a faulty sensor (any idea why GOLD didn't catch it?). You can see the queues per NP and per level. 7600-ES+20G3CXL has two NPs, each one controlling 10 ports. Each NP has 3 tm; tm 0 in each NP doesn't seem to be updated by the configuration changes (any clue?). The ones that interest you are tm 1 and tm 2 entity values, which control 5 ports each. According to the above outputs, there are 32768+32768 entities per NP, so i don't know if the official number of 64000 queues is totally correct. i.e. can you use all of them on the first 5 ports? 7600/ES+ QoS documentation provides some info, but it's not very clear. If you have a single level policy, then you only reserve queues from L4 level. If you have a hierarchical policy with 2 levels, then you reserve queues from L4 and L3 levels. If you have a hierarchical policy with 3 levels, then you reserve queues from L4, L3 and L2 levels. 1) Does anyone have any explanation about the 2 extra L4 queues from the last example? If you count the leaf classes, you'll find they are 15. I guess the last 2 classes (that have no child) reserve an extra "hidden" child queue, probably in order to make their depth equal to the others'. 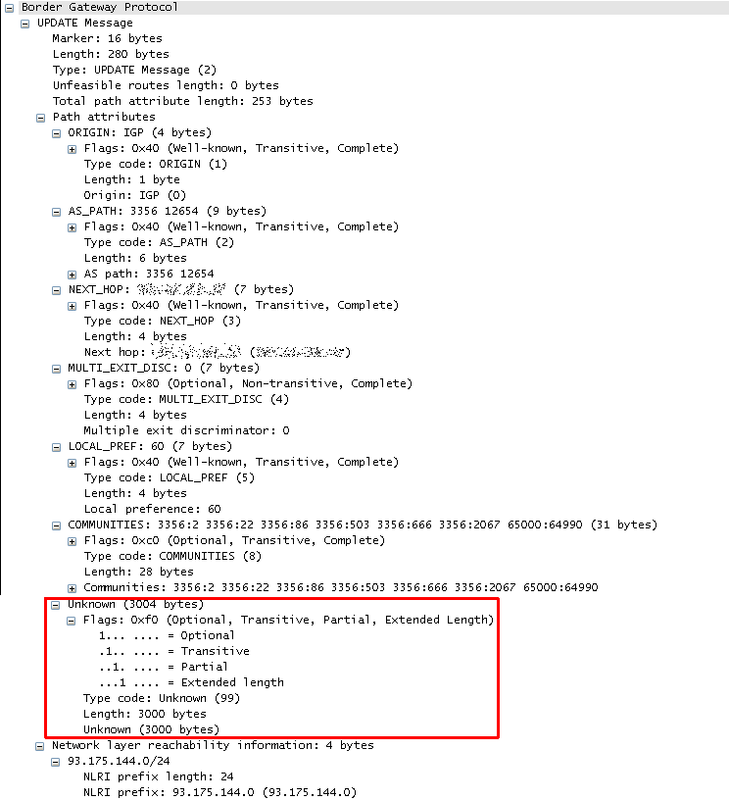 You might probably know that it's possible to send messages from one vty line to another on a single Cisco router. The last few days i'm trying to find a way to send automatically some custom-made udp packets from a Cisco router to a specific destination, in order to emulate the heartbeat mechanism of SixXS. Tcl seemed like a nice option, but as far as i know its implementation in Cisco IOS doesn't support extensions (Tcl doesn't have a builtin command for udp channels, so we must use an extension to enable it). Asynchronous Serial Traffic Over User Datagram Protocol or UDPTN (UDP Telnet) is an IOS feature that provides the ability to encapsulate asynchronous data into UDP packets, and then unreliably transmit this data without needing to establish a connection with a receiving device. UDPTN is similar to Telnet in that both are used to transmit data, but UDPTN is unique in that it does not require that a connection be established with a receiving device. Its usage is quite simple. You just have to enable udptn as an output transport under your vtys and then open a connection to the remote end. You have various options regarding the role of each device, but usually one end is transmitting and the other end is receiving. If you need 2-way communication, then you need to enable both directions. You can use any port above 1024 or just the default 57. 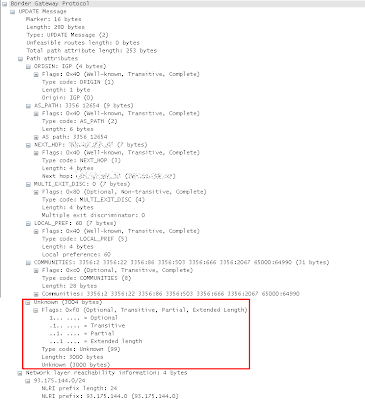 It becomes more interesting if you send packets to a multicast/broadcast address, so everyone having an open connection there will see the data. There are some annoying things, like that you can't see locally the entered chars, or that you get chars on top of the previous chars (you can use spaces in order to clear the line), but you can't expect the full thing. Voila! You just made it possible to have a chat with your friend at a remote Cisco router! If you want to stop the session, you can use Ctrl-Shift-6 + x and then enter the "disconnect" command. dispatch-character 13 : This one causes the current number of typed chars to be sent after you press Enter (ASCII 13). By default each char is sent immediately. Note : Because of its ability to send raw UDP datagrams that might conflict with other protocols, UDPTN has an implicit access list that only allows UDPTN connections to UDP port 57 (default) or UDP ports greater than 1024. If only now i could find a way to send such messages automatically, i would probably solve my initial issue. EEM doesn't provide a mechanism to feed chars into a remote session and the Tcl "typeahead/exec" solution makes the process get stuck (and i can't find a way to clear it). Any idea how to send Ctrl-Shift-6 + x?